During the last decade the Internet has been a platform for developments in the kitchen utensil market to flourish seeing an influx in new and unique products which help the user to become more confident with their home cooking, while saving both space and time. Introducing the Spiral Vegetable Slicer. The Spiral Vegetable Slicer by Kitchn Kits is a practical kitchen utensil allowing the user to slice vegetables with ease providing a quick and convenient experience in comparison to using regular kitchen utensils such as a common kitchen knife. The Spiral Vegetable Slicer by Kitchn Kits presents an ingenuous design featuring a hand held plastic vegetable cutter with two blade sizes for flexibility and two julienne sizes of 2x3mm or 3.5x5mm on either end of the gadget. The Spiral Vegetable Slicer by Kitchn Kits presents an easy to use, dishwasher safe product that is small enough to fit into a kitchen drawer. 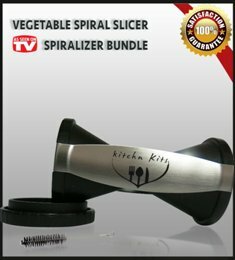 The Spiral Vegetable slicer is now available as a bundle exclusively at Amazon.com with various bonuses included such as a free cleaning brush for the product and free recipe e-book and video tutorials which will help the user to become familiar with the product. Kitchn Kits also offers full customer care and support with the purchasing of the product through amazon.com as well as a 100% money back guarantee if the customer is not fully satisfied with the product.